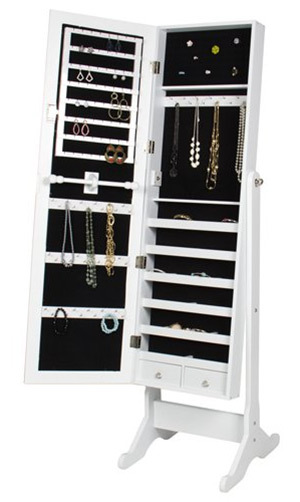 Jewelry armoires offer gorgeous storage for earrings, necklaces, and other small accessories. 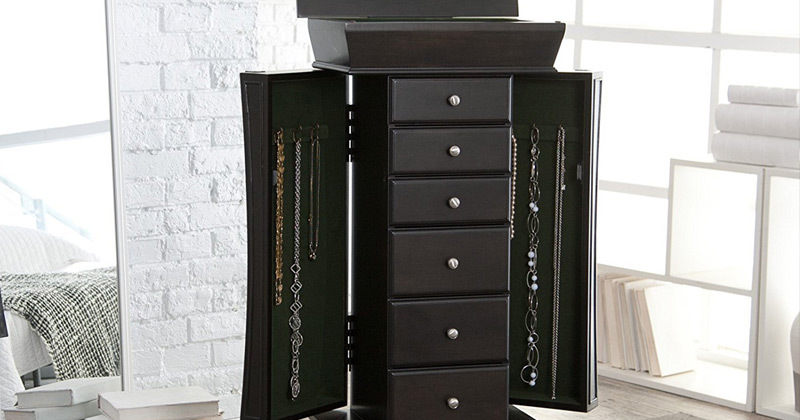 These armoires come in many different sizes but they’re all made for keeping your jewelry safe in one location. In this guide I’ll share tips for finding the best jewelry armoire for your home. No matter what your budget or how much space you have I guarantee there’s an armoire out there for you. Each jewelry armoire is very different in design and style. This means you’ll need to consider the actual look and color scheme to see how it’ll blend with your room. Most people think of the freestanding armoires since they’re the most common. But the wall-mounted and over-the-door styles are also great if you don’t have much floor space. Cheval mirror armoires bank on combining mirrors with jewelry storage. This way you have access to a full-length mirror for checking your outfit while still getting direct access to the jewelry inside. Each of these four armoires will also have varying sizes and internal space. This means you need to count up your jewelry and take inventory to make sure everything you have will fit. If you only have a few earrings then you don’t need an armoire with lots of loop hooks. Likewise if you have dozens or hundreds of earrings then you’ll want a unit with far more hooks. Consider the type, internal space, size, and price when looking for armoires. There is no single perfect model for everyone so this can make buying a tough call. But if you have an idea of what you’re looking for it’ll make the process a whole lot easier. 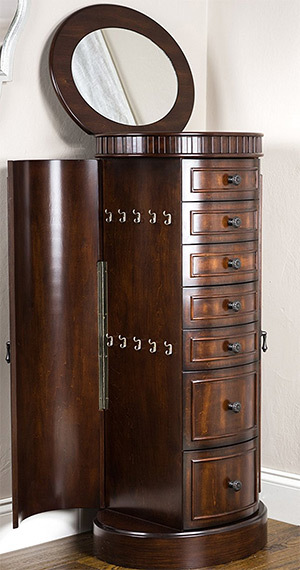 The Hives and Honey Henry IV is a very traditional jewelry armoire made of wood veneer with a walnut finish. This comes with 8 drawers where the top 5 are somewhat thin and the other 3 are a bit larger. At the very top of the armoire you’ll find a top compartment that opens with a mirror. This mirror is a tad small but it offers plenty of space to check your makeup and earrings. Underneath the mirror you’ll find even more space for jewelry storage. And the side doors open up to reveal even more space if you have larger necklaces, rings, bangles or anything else. These side drawers each have twenty hooks altogether which should offer more than enough space. It’s also nice to see the very top compartments locks, but this is the only drawer that actually locks on the whole unit. If this armoire is only sitting in your bedroom then it probably doesn’t need a ton of lock-proof security. Overall a fantastic unit with a beautiful finish. One of the tallest and sturdiest armoires you’ll find with plenty of storage space. Another fantastic design for a standing storage option is this dark Ella Armoire which stands a tiny bit shorter and comes with fewer drawers. But it has many of the same features including a flip-top compartment with a mirror and 2 flyout side drawers. The rich dark finish should match most bedrooms, although it can stick out in lighter rooms like a sore thumb. But it’s super light and surprisingly small. The entire thing spans just over a foot wide and less than a foot deep from the wall. Plus it’s super light so this is a great piece for someone who prefers to live light. By default this ships with two top pieces that you have to connect together. But this assembly is stupid simple and should not take you more than 5-10 minutes. And once it’s all setup you’ll be surprised how much space you have! For such a little unit this thing packs a punch. The very top 2 drawers are a bit smaller than the bottom 3 drawers, but they all have plenty of space for all jewelry. You can split up your collection in the top compartment and even keep hanging pieces(earrings, necklaces) in the side doors if that’s easier. The interior felt lining is incredibly soft and this smaller jewelry armoire is one of the best you can get for the money. 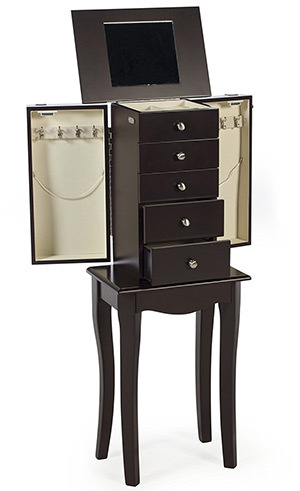 The unique design of this Best Choice Products Armoire makes it a fantastic pick for anyone who likes the look. It has many curved elements with ornamental carvings in the base and a chestnut finish. Measuring almost 39″ tall(about 3 feet) this armoire is small but usable. It feels compact and the drawers may seem tighter than you’d expect. But unless you have boatloads of jewelry this piece should fit everything well. Not to mention for a budget item I’m impressed with the quality. Each drawer has a very soft lining and multiple dividers for keeping jewelry organized. The very top 4 drawers are a bit smaller than the bottom 3 but they all use limited space as an advantage. One nice thing about this armoire is the variety. It has a number of different storage pieces like cubbies, ring hooks, necklace hooks, and earring organizers/dividers. But one thing I don’t like is the overall design of this armoire. It just feels too “engineered” and doesn’t feel like a natural piece in the room(in my opinion). Can it work well for some? Absolutely. Just make sure your bedroom can blend with this shade of chestnut and that you don’t mind the smaller height. Powell furniture makes some incredible pieces and this dark ebony jewelry armoire is one of the finest in their collection. It comes with a flip top and 2 side expanding doors with more storage. The color is a crisp dark shade with a shiny finish. It measures just about what you’d expect for a jewelry armoire coming in around 3 feet tall. All of the interior lining is made of cellulose fiber rayon and it matches the dark black of the cabinet. The main chest has 6 pull-out drawers, the top 4 are a bit smaller and the bottom 2 are supersized. But they all have plenty of space for jewelry of all kinds. The flip top is surprisingly light and very sturdy. It has a good sized mirror that should work for anyone. But since this is small you’ll need to bend a little to get your face right in view. Even with the mirror fully upright this unit only measures about 4 feet tall. The drawer handles use a unique circular design with an empty center. This can feel weird at first but it makes opening the drawers a whole lot easier with less of a grip. Powell knows good design and this armoire is one of their best pieces. If your bedroom can mesh with the dark ebony exterior then you’ll get a lot out of this armoire for years to come. 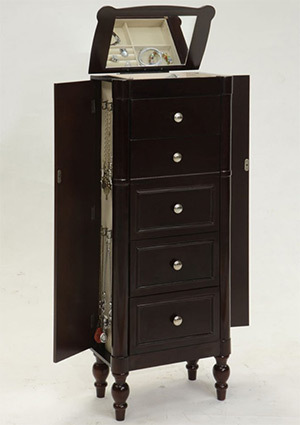 Another simple dark armoire is the Finley Home Cora Jewelry Armoire with silver hardware and a much smaller base. 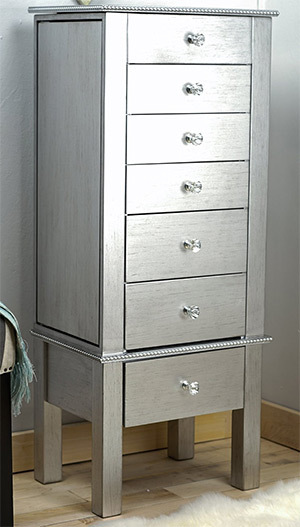 The silver accents on the handles really shine and the simple legs make this modern armoire a sight to behold. One thing you’ll notice right away is the lack of storage space compared to other units. The legs on this armoire come up a lot higher than others. As such the actual body lacks a bit in drawer space. In total this thing measures about 1 foot wide and just about ⅔ of a foot deep. It stands less than 3 feet tall making it one of the smallest armoires in this list. Add in the fact that almost 50% of this piece is taken up by the legs and you’ll see why it doesn’t offer as much storage. Out of the 5 pullout drawers the bottom 2 are fairly large while the top 3 are pretty thin. If you’re okay with this smaller design then by all means pick one up. It’s finished with a lovely shade of espresso and the size can be a benefit to anyone with a smaller jewelry collection. The mirrored compartment does have a few cubbies but not much. The real benefit here is the mirror itself which can fold back past 90°. Even though it’s small it can still work well as a vanity mirror while trying on jewelry. This Finley armoire has one major point that’s both a weakness and a strength: the short build. 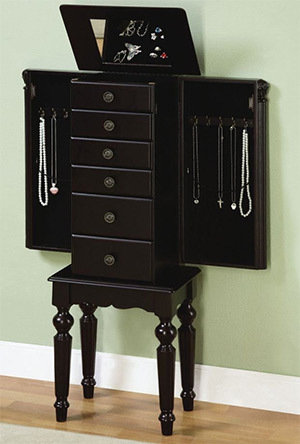 If you want a really small jewelry armoire and like the darker color then definitely check this out. But if you want something spacious and tall then you will not be happy with this model. Some people like their armoire mixed with a full-length mirror to really see the whole outfit together. And the Songmics wall/door jewelry armoire offers a great solution mounted on your wall or strewn over the door. The side of the cabinet has a small lock so you can keep it secured at all times. The length of the cabinet also has a full mirror made of real glass and a very thick MDF frame. At the top you can attach hooks that clip onto the top of the door, and you can keep this mirror attached to the wall as well. Inside is a dark black velvet lining with a whole case of storage options. At the top you’ll find 6 bright LED lights that shine all the way down the case. This has dozens of hooks, earring holders, smaller cabinets, and a rod for keeping bangles or bracelets. Towards the bottom you also have some shelving for scarves and sunglasses or similar accessories. Weighing only 20 lbs this thing should be easy to get on the wall or on your door. It comes with everything you need to mount the mirror and get the lock working. However the LED lights require three AAA batteries which are not included so you’ll need to get those yourself. For the price, size, and build quality I cannot imagine anything better. This is perfect for a master bedroom or for decorating your daughter’s room. 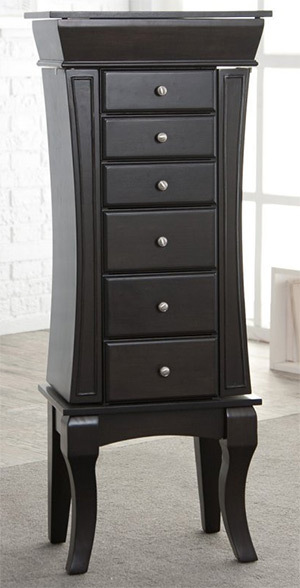 With a dark finish and bright flower-shaped handles I have to commend the Coaster Home 900139 Armoire for a very unique design. This is another standing armoire and it’s a smaller one only measuring 3 feet tall. It comes with 5 drawers, 3 smaller and 2 that are slightly oversized. Plus you get 6 hooks in both of the side doors which work great for hanging necklaces. Unfortunately the top mirror is very small and not super impressive. It’s certainly not impossible to use but it’s definitely smaller than a normal armoire. This is where the full-length mirror kinda comes in handy. A typical jewelry collection should fit in this perfectly. It’s a lot bigger than a standard jewelry box so it’ll offer a whole lot more room. But it’s also far from the tallest unit in this list, so it offers a nice middle ground too. The clear flower handles on the drawers really add to the design and make this feel like a welcoming piece regardless of your decor style. For one of the most decorative armoire designs check out the Hives & Honey Blair Walnut Jewelry Armoire. It has a dark shiny exterior with a brilliant shade of walnut finish that gives off a classic “antique” look. Measuring 40″ tall this unit comes with 7 pull-out drawers and 2 side drawers. The pull-out drawers all have felt interior and they measure pretty large. Each drawer has a nice pewter/silver handle with a clean ornamental design. One thing you’ll notice in the side drawers is the lack of felt. They have the same wood as the exterior and just have a series of hooks(10 on each side). You may like this wood interior style and it certainly won’t damage the hanging jewelry. But you may prefer felt here too and that can be a deal breaker for some people. The rounded base feels incredibly firm on the ground no matter how much jewelry you put into this thing. It is surprisingly solid and pretty heavy weighing about 65 lbs empty. At the very top you’ll find a flip-up mirror with a circular design. This feels like a typical vanity mirror and it’s one of the main selling points for this armoire. You won’t need to duck down much to get your face in the mirror and there’s plenty of space for all of your jewelry. Plus you’ll find a few other mini compartments underneath the flip-top mirror for storing even more jewelry. The space never seems to end! With an armoire like this you definitely get what you pay for. Quality craftsmanship, plenty of space, and a beautiful piece of furniture that’ll add some elegance to the bedroom. If you want a sleek modern design then check out this contemporary jewelry armoire designed with a dark exterior and bright fixtures. The photos make this armoire look pretty small but it’s actually close to 4 feet measuring about 40″ high. It comes in a near-black espresso finish and has tons of compartments. On the front you’ll find 6 drawers, 3 smaller ones and 3 bigger ones. On both sides you can pull open the side doors for necklace hooks with 3 hooks on each side. These doors have the least amount of storage in the armoire but they’re nice to have. At the very top you’ll find a flip-top cover with a mirror and extra space for even more jewelry. The mirror should be plenty usable from any angle and the shape is exquisite. Each drawer uses a very dark green lining with some type of felt or softer material. The material itself feels very smooth but the dark forest green color may not work for everyone. Granted this is tucked away out of sight and shouldn’t be a huge problem. But if you’re picky with colors then be sure to look over the pictures and make sure that shade of green works for you. The actual shape and style of this armoire feels incredibly modern. The legs are thick and sturdy along with the side doors. Overall this piece is just beautiful and if you like the design then look into nabbing one for your home. 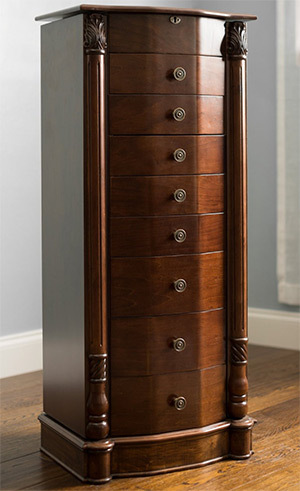 For a much more traditional look check out this Gwendolyn Jewelry Armoire made for the Home Decorators Collection. It’s another fairly small unit with a very dark felt inside(colored a dark red/maroon). It comes in a rich mahogany finish with swinging doors on the side and a flip-top mirror cover. Each side door has 4 hooks and a light string for opening & hanging. For such a thin armoire I’m surprised how much space these side doors have(the armoire measures ~10″ deep). On the front you’ll find 6 pull-out drawers: 4 smaller drawers and 2 bigger ones. They each have gorgeous handles with ornamental patterns that mesh nicely with the traditional design. Note you will need to set aside some time to get this assembled and put together. It’s not hard but it does have a few screws and pieces that you’ll have to mess with. Shouldn’t take more than one hour to finish. And once it’s complete you’ll never need to worry about construction because it’s sturdy as a rock. The whole thing weighs over 40 lbs empty and the legs are built to hold some heavy weight. Specifically the back legs which use rectangular shapes over curved legs for more leverage. Make sure you like the red felt lined drawers because this color is used throughout the whole interior. It’s not very bright and it actually matches nicely with the wood. But it is strong and if you’d prefer a darker interior then maybe consider a darker unit like the Powell armoire. But the Gwendolyn is pristine in size, shape, design, and space. Assuming you enjoy the more traditional style and like the red felt interior then you’ll be pleased. It’s rare to find a full standing mirror functioning as a dual armoire. But this mirrored jewelry cabinet has one of the finest designs you’ll find with a very solid base and plenty of room for storing all your accessories. By default the mirror stands about 5 feet tall and tilts back for checking your outfit with ease. This cabinet door opens on the right side and has storage space behind the mirror and inside the cabinet. You’ll find two drawers, dozens of shelves and even more hooks for earrings & necklaces. Assembly is crazy simple and this is one of the best cheval mirrors with a sturdy stand. Unlike the Songmics mirror this one does not have top LED lighting. That makes this cheval mirror a bit cheaper and easier to setup. Plus it still comes with a front lock so you can keep your jewelry tucked away and fully secured. The glass in the mirror is crystal clear and while it doesn’t seem to be pure glass, it does function properly and doesn’t have any of that funhouse distortion stuff. The frame is not made of solid wood, most likely MDF, but it feels incredibly strong. This is one of the strongest standing mirror armoires you’ll find. For whatever reason I cannot find this in any other color aside from white, so for now that seems like the only choice. But white can blend with everything so this mirror can work well for all room styles. Here’s another Hives & Honey design that actually draws attention and stands out amongst a sea of similar designs. The Celene Jewelry Armoire is off-white, aesthetically pleasing, and uses funky ornamental designs on the doors. The two front doors open to reveal 7 shelves and two inner doors that open to the side. These inner shelves all have small cubby designs so they don’t look like the typical drawers that you find in other armoires. On the outside you’ll find a French-style door with checkered squares and mirror inserts. These mirrors aren’t clear enough to check your whole outfit but they do add a nice aesthetic touch. There is a flip-top mirror at the very top of this 41″ armoire. It’s a rectangular mirror and spans the entire width of the unit measuring well over a foot. This mirror should be perfect for checking your jewelry and catching a glimpse of your outfit before you head out the door. Another huge benefit is that this unit ships almost fully assembled where you just need to add the very top lid with the mirror. Everything else is already constructed saving you time and headaches. The interior drawers all have a light tan finish with a very soft felt material. This blends beautifully with the eggshell/antique white finish and it brings the whole piece together. It seems every piece from Hives & Honey is glorious and this armoire is no different. 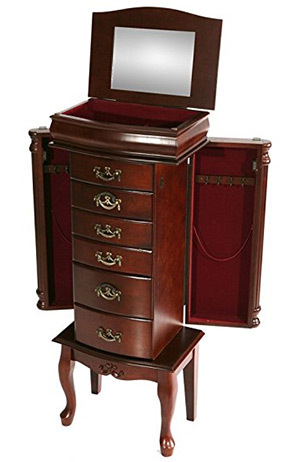 If you like the antique style and the front double doors then you’ll be delighted to keep your jewelry in this thing. For a much more futuristic/modern appeal check out the Hives and Honey Kimberly armoire. This bright chrome silver design feels very modern and brings a unique style that you just can’t find in typical armoires. The color is very metallic but this piece is made of typical MDF wood just like all the Hives & Honey armoires. It has 7 pull-out drawers with 4 smaller drawers and 3 larger ones. They all have a small crystal knob that goes well with the silver exterior. Inside the drawers you’ll find a plush felt lining colored bright peach/pink. This lining is also inside the top compartment underneath the flip-top mirror. But the two side doors do not have any felt, instead using the same silver finish. But you can get this same Kimberly style in a different finish like espresso. Some people like the chrome finish, others don’t. It’s really just personal preference. The very top mirror lid has silver beaded trim all across the edge. This adds a good amount of weight and while it’s not a huge detriment, it does feel a bit excessive. It only comes in the metallic silver design so it’s more like an accent piece. And while this does take on a color much like metal you can rest assured this is made of MDF or similar wood. With so many armoires to pick from you’ll have to dig into the details and find exactly what you want. 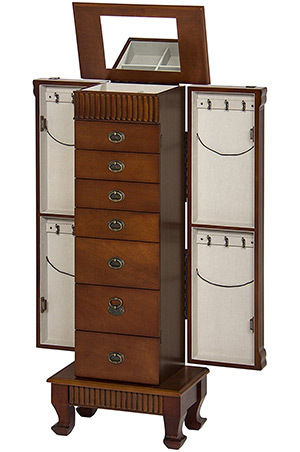 But I’d say the best standing armoire you can get is this contemporary jewelry armoire by Nathan Direct. It’s clean, subtle, and spacious with a modern design that’ll match any room. If you’d prefer a hanging alternative then this Songmics mirror+armoire fits the bill. 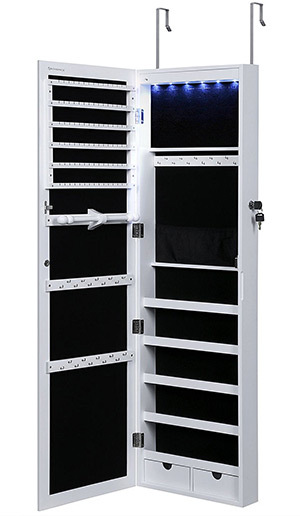 It functions more like mirror cabinet than an armoire but it still has plenty of space for jewelry and the interior has light-up LEDs to help you find whatever you’re looking for. But take another look over this list and see if anything catches your eye. 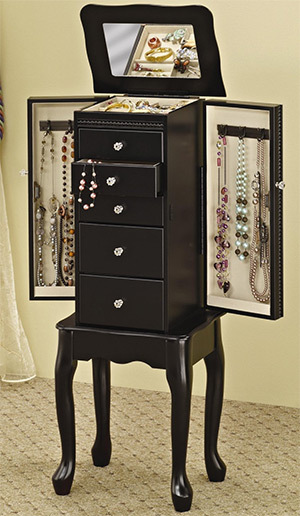 Jewelry armoires come in dozens of styles and you’ll know when you find one that fits your needs.